What Is the Life Cycle of a Fly? 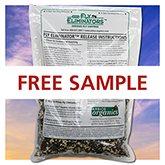 The information below will help answer most of your questions about Fly Eliminators. If you have additional questions, please call us so we can answer them. Toll Free 1-800-827-2847. Fly Eliminators are gnat-sized, nocturnal, burrowing insects that do not bite, sting, or harm humans and animals. Adaptable to all climates, these parasites reproduce in two to three weeks, constantly reinforcing the beneficial population. Expect a reduction in general fly population in four to six weeks. ARBICO's fly parasites seek out the pupa of the fly at night. They make a tear in the pupa to feed and the females deposit (oviposit) their eggs within the pupa. Those eggs begin developing and feeding on the immature fly... killing the fly. Fly Eliminators hatch out of the fly pupa in about 17 to 21 days ready to begin the cycle all over again. It is safe, non-toxic, USDA approved and very affordable when compared to poisons! What Is the Life Cycle of Filth-Born Flies? The fly lays an egg that looks like a speck of sugar. Within a short time, literally hours, the egg develops into a larva that we call a maggot, which is microscopic and so small it is almost impossible to see. This little maggot is light sensitive and with it's strong little body writhes and undulates itself deep into the ground and manure away from the outdoor light. Once buried, it continues to feed and grow until it reaches a certain size and then it pupates. This is the cocoon stage of the fly which looks like the size and shape of a piece of rice and chocolate in color. Fly parasites are shipped via US Mail. Ground shipping can be requested by phone at 1-800-827-2847. ARBICO Organics guarantees live delivery of Fly Eliminators shipments. Please contact us within 14 days of shipment with concerns about viability or hatch rates. Unit sizes are units of measurement, not warranties or guarantees of performance. We recommend releasing a shipment every 2-4 weeks throughout the fly season, but releases ranging from 1-6 weeks are not uncommon. The quantity required and frequency of application can differ according to region, size, condition of property or stables, severity of fly problem, neighbors, manure management, number of animals and start date of program. Once they arrive, examine the clear plastic bag for hatched Fly Eliminators. They will be crawling around inside the bag. Your fly parasites are ready for release when you see 30-50 active in the bag. If you do not see movement within the bag, you can speed up the process by placing the bag in an old pillowcase and setting it on top of your hot water heater or refrigerator. Check them for hatching activity daily. You can release the insects before they hatch; however, they must be covered with a thin layer of manure or ground cover to prevent birds and ants from consuming the unhatched fly parasites. Where Do You Release Fly Parasites? What Is The Best Method For Releasing Fly Eliminators? Our fly parasites are shipped as parasitized pupae in a wood chip medium and are dispersed by releasing a small handful near breeding sites (listed above). To release, scratch a 1-inch hole in the ground with your boot heel, drop in a small handful of sawdust and pupae, and cover them with straw or dirt to protect them against wind, birds, ants and pesticides. The amount of parasites to release depends upon the size of the "hot spot". Use as small as a teaspoon or as large an amount as a handful. These parasites travel 90-150 feet in search of visible fly larvae and pupae. Apply to as many hot spots as possible, concentrating heavily on obvious fly-breeding areas. Repeat this release method in slightly different spots on subsequent applications. In this way, new cultures of parasites will be evenly distributed throughout the fly season. 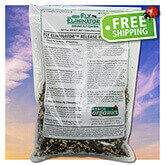 What Do I Do With Fly Eliminators Upon Receipt? Store them at room temperature (approximately 70  80 degrees F) until they begin to hatch. DO NOT leave insect shipments in direct sunlight or areas of intense heat. If needed they can be stored at 42 degrees F in a refrigerator for 3 - 5 days. SPRING AND WINTER: Maintain parasites at 80°F to ensure proper hatching. Temperatures below 80°F slow the process. SUMMER AND FALL: Warmer temperatures may cause hatching to occur more quickly. It is normal to receive your shipment and find hatched parasites in the bag. Release immediately. Hatching will continue over the next several days as the rest of the parasitic wasps emerge. When Do I Release My Fly Eliminators? Begin your program after your last expected frost date. It only takes three consecutive days of 40°F weather for overwintering fly populations to start developing. Each female fly lays up to 1,000 eggs in her lifetime, so it is important to release the fly parasites before you see the first fly of the season. The released fly parasites lay eggs in the overwintering pupae, killing the developing fly and reinforcing the indigenous fly parasite populations. Continue releasing the fly parasites throughout the entire fly season. Notify an ARBICO consultant if any of your conditions change, like you have more animals than you did, ants are becoming a problem, or neighboring properties are contributing to your fly problem. Use fly parasites in unison with EM-1 Microbial Inoculant or Odor Away to break down organic matter that becomes fly breeding habitat. This practice along with proactive manure management are essential parts of a complete fly control program. Are Fly Eliminators Susceptible To Pesticides? Do not spray the facility at the same time you release the insects. If you must spray, we recommend that you spray at least 48 hours before releasing Fly Eliminators. Can I Customize My Fly Eliminator Program? Yes! ARBICO Organics Fly Eliminator programs can be customized here. If you don't see a program that fits your needs, we will be happy to assist you in setting up a custom program tailored to your specific situation. Call us at 1-800-827-2847 for a fly control recommendation from one of ARBICO's knowledgeable pest control consultants.